i don't get it. Who tells lies and drinks?? It's absolutely beautiful! It looks like something out of a myth. Will the list of great things about Japan ever end? I have no idea why, but I just find it (the animal) so enchanting... I'm weird, aren't I? Perhaps they could be another obsession for me? I wanna get it as a pet! Anyways, I was in New York, looking up, and I'm disappointed! I did not see people dangling from wires, I only saw a giant, rotating lobster. I'm going back Monday and taking piccies! YAAY! Wait, is it real or just a myth? i agree with raph. i looooove weird things!!! and i am a little animal obessed. reagardless, that's awesome!!! I have a few questions about the books Ananka. (I was rereading them). Is pokrovia a real place? How did they get into the Chinatown Savings and Loan if the trapdoor was nailed shut? Did Oona's twin survive? ew... that 2nd kappa story creeped me out, but i am officially intrigued with them. just like aliens! and i agree with raph; the kappa are a obsession possibility for me. It looks so cute in the picture. 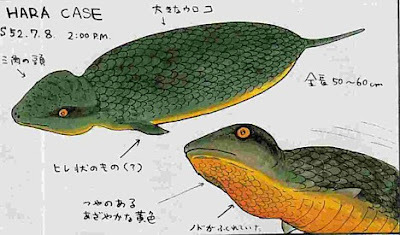 It looks a bit like the Japanese Giant Salamander... except with scales. Maybe someone just messed up their reptiles versus amphibians?! Kappas rock. Well, they eat people. But otherwise, they rock. Wow, that looks like something a fantasy artist would dream up. It's awesome. Yeah.... awesome. I want one. Where's an eBay link so I can get one? there sooooooooooooooooooooooooooooooooooooooooooooooo cute! I wonder if they bite?